Deathstrike wrote: Makes you wonder why Kanzaki would create a Rider deck that requires contracts with so many Monsters. It just seems like an impossible task to feed that many. You mean those blank decks that don't become customized till a contract is made? I get where you are going, but we know that the Contract Cards can only hold 1 monster. Otherwise, Asakura could just have had all his monsters in 1 card as well. 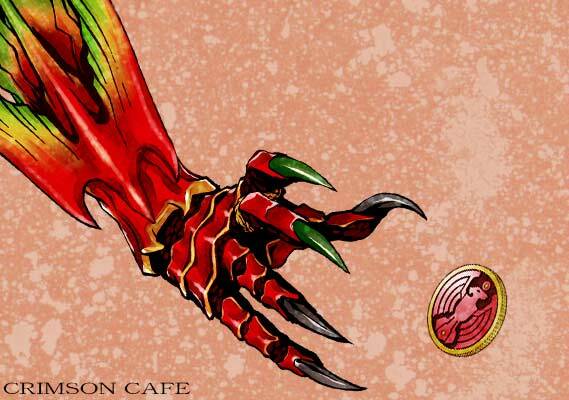 Imperer's Contract Card was obviously modified to hold hundreds of monsters. Though I guess another explanation could be that the zelle monsters always travel in groups. So if you get control of one, you get control of them all. actually, couldn't Imperer have paid the riders to finish off his contract monsters? After that he could easily give up his deck. Wikipedia says something to the effect of Imperer actually only having *one* contract monster, but the "Zellers" (Gazelle type monsters) travel in a herd, and so, even though he only had a contract with one technically, the others followed it into battle. So I guess he only had to worry about his one "official" contract monster? I dunno what Wikipedia's source is, but it's worth noting that Ouja has three contract monsters, and he has to use a different advent card for each one (unless he's summoning their hilarious combined form). I only remember seeing Imperer using the one card which summoned the lot. Shame about Imperer. I disliked his character, but I quite liked his rider design. Especially I liked the knee mounted card slot. I expected him to have more in the way of awesome kick moves. Man I'm like the only one that didn't hate the new Rider lol. Its sad to see him go. Then there were 5...or 6 if Odin is being counted. The problem was is that he acted as a snob/bum. You usually hate people like that. I wonder if he could of just given the deck to say Shinji and quit. Would they still go after him or demand shinji to feed them. >The problem was is that he off as a sob/bum. You usually hate people like that. I don't really see why. Should I hate poor people because they're less fortunate than others? archer9234 wrote: The problem was is that he acted as a snob/bum. You usually hate people like that. I wonder if he could of just given the deck to say Shinji and quit. Would they still go after him or demand shinji to feed them. So you dislike rich and poor people? Also, what was the point of even introducing him at this point? He maybe caused a bit of strife, maybe he might have sent Tiger over the edge, but I don't know that. He made a Contract with Gigazelle, but there are two others type's (Ultrazelle's and Omegazelle's) over it. The Herd mentality sounds right, or else he could only controls Giga and Megazelle's. ryuho209 wrote: Also, what was the point of even introducing him at this point? He maybe caused a bit of strife, maybe he might have sent Tiger over the edge, but I don't know that. I think he was introduced now for several reasons. First: To show a more human rider. Shinji is a human, but he fights to stop others fighting. Ren is human, but he is the selfless person. This new one fought simply to get out of his slot in life, and this was what he saw as his only chance. It wasn't to save a life, it wasn't even really for money.. it was simply a struggle to improve the sad life his father forced on him. His humanity was also what made his death more tragic, as his desperation drove him to keep fighting. Two: He was also introduced, I feel, to show us that the fight is still on. Lives are still at stake, and this isn't a monster fighting game.. it is a rider war. Their lives are at risk if they try to stop, and their lives are at risk when they turn their backs to even people they consider friends. We have seen riders killed before, but not when they were begging for help, not when they were actually trying to live. The first one killed was eaten by his monster, the second was someone who thought it was a game. This guy died when he just wanted to live, and the only reason he was fighting at that point was to survive... as his life had been threatened. So, again, while I didn't really enjoy his character, I do see where he was kind of needed for the story. The story can move on a bit more, as we see that Tiger really has a bolt broken in his head, we also see in a better light -just- what is at risk and on the table for these guys. Because there are 13 decks? Tuss4 wrote: actually, couldn't Imperer have paid the riders to finish off his contract monsters? After that he could easily give up his deck. seriously any thoughts on this? When you said that, I thought "...and after killing the monsters the other Riders would probably then kill him too". Hmm, now I really have problem figuring out Asakura's code. spoiler]He attacked a pretty much dying Imperer. I don't remember Imperer ever vexed him( Maybe just that part about with Kitaoka's "introduction" letter). That said, Toujou ranks even higher on the twisted-o-meter than Asakura. spoiler]if he was humble enough to tell Shinji and Ren that he no longer wants to fight, perhaps they would help along( Shinji might given his knowledge of Tezuka's case.)? Releases have been fast these days. 5 more to go, so keep up the good work!